My Twitter stream wants me to get on Pinterest. Internet: It’s the next big thing, emw. You should be there. Me: Probably true, Internet. Friends who use Pinterest do seem to love it. But I believe in being realistic about what you can accomplish. Using Twitter and, to a much lesser extent, Facebook to promote The Analytic Eye takes up about as much time as I can currently devote to social networks. 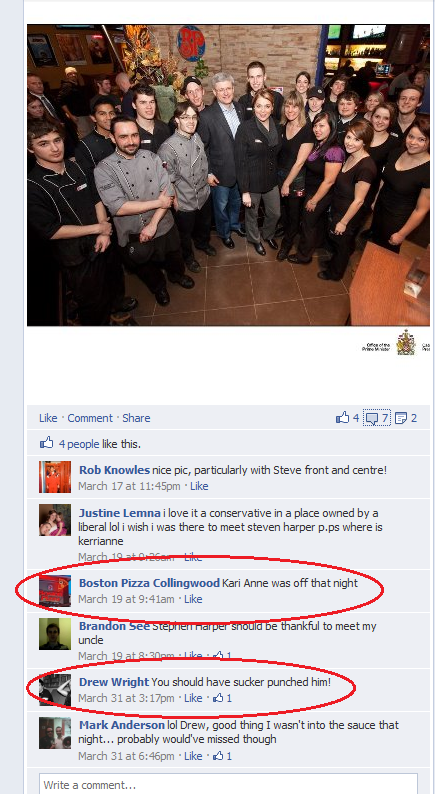 And, as the Boston Pizza restaurant in Collingwood, Ontario, recently demonstrated for me, having a haphazard presence on a social network won’t do your brand any favours. 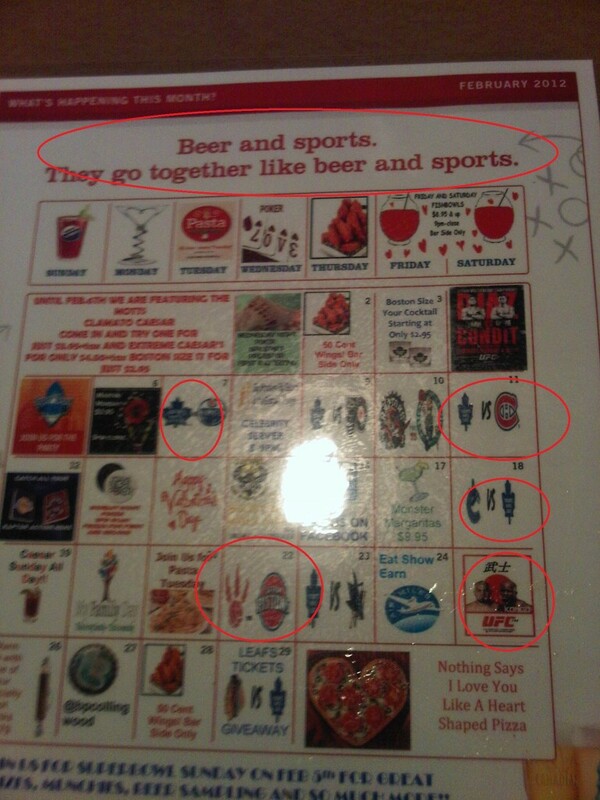 Earlier this year, my spouse and I had dinner at the Boston Pizza in Collingwood, Ontario. This isn’t a food blog, so we can skip the details about the meal except to say we had a good time. 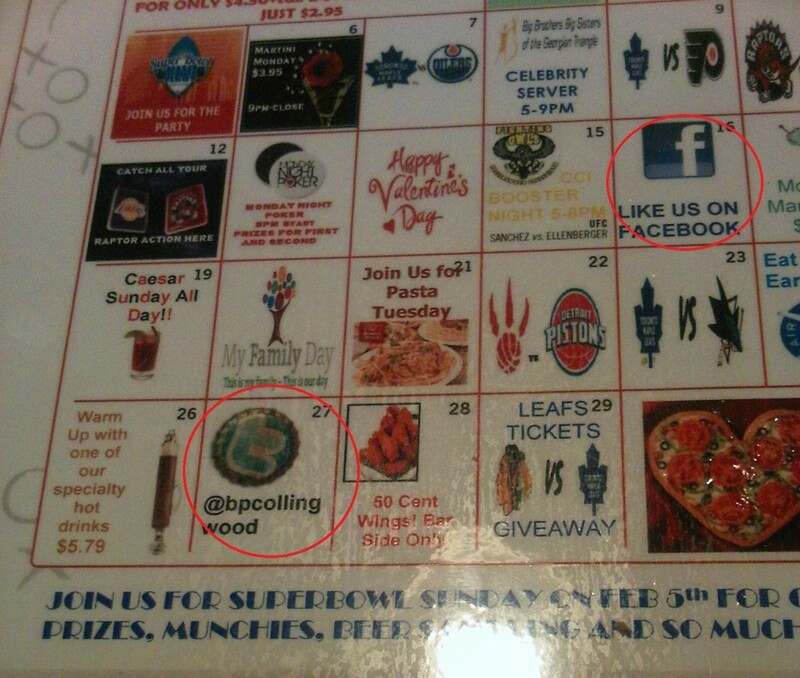 Event calendars make sense for restaurants trying to build repeat customer business with the locals, particularly if you cater to sports enthusiasts as Boston Pizza does. Before we consider the tactics in play, let’s step back and look at the larger digital picture. 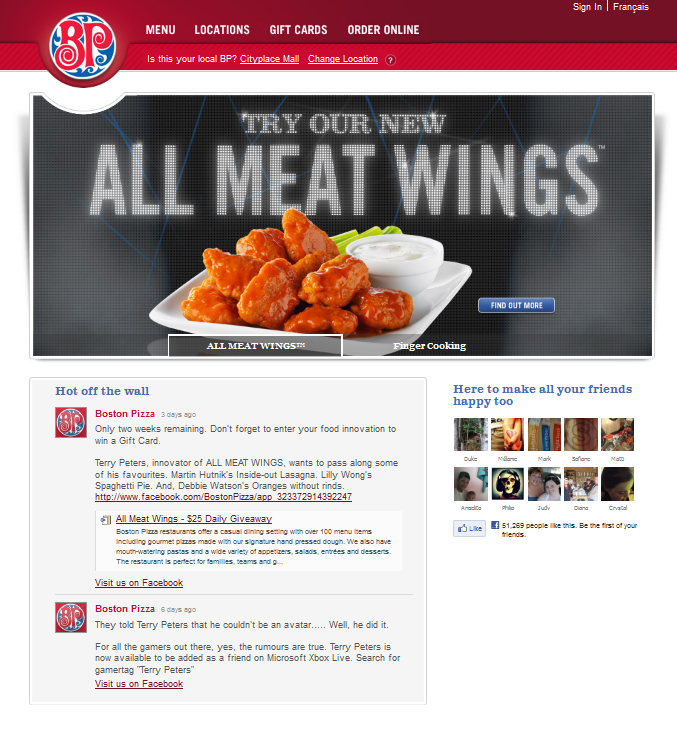 Boston Pizza, like most restaurant franchises, takes a centralized approach to its web presence, which focuses on the overall brand experience. 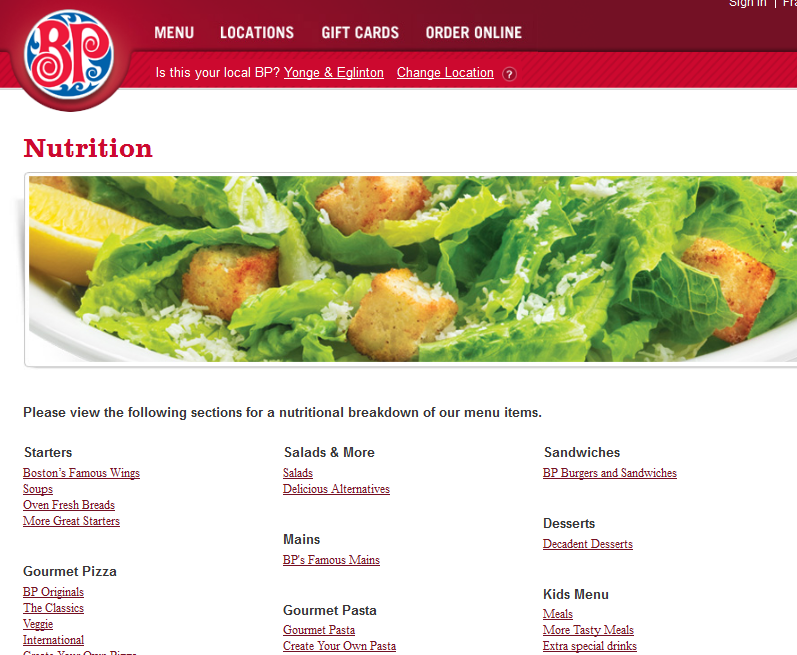 I e-stalked them when we were deciding where to eat so that I could check out their online nutrition calculator. This is my standard MO when eating out. I always want to know if I would enjoy eating something on their menu without blowing my post-kid nutrition plan (such as it is) out of the water. It is uncluttered and easy to use. 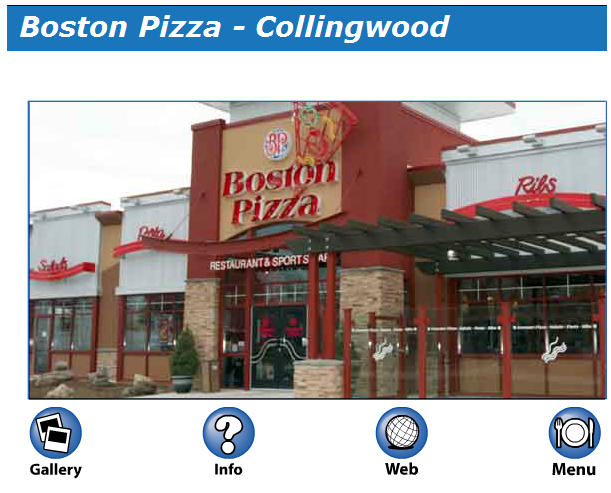 Individual Boston Pizza restaurants do not maintain their own web sites. I am in complete agreement with that decision. It is cost effective and inhibits the likelihood of brand-related wackiness rearing its head. Nothing makes people crazy like the ability to customize a pre-existing web template. 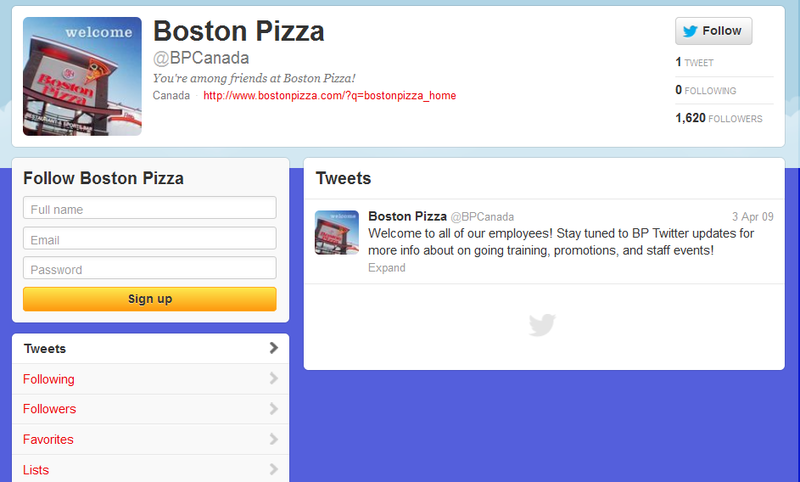 It looks like every other Boston Pizza I have ever seen, which is exactly the point. 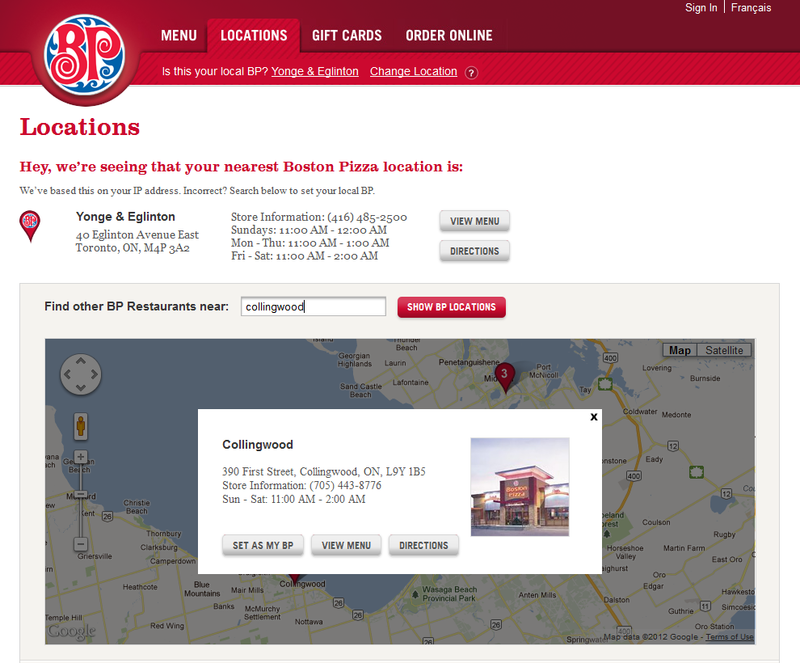 I didn’t know until I saw the ad that the Collingwood Boston Pizza has location-specific social media presences. And here’s where things go way off the rails. 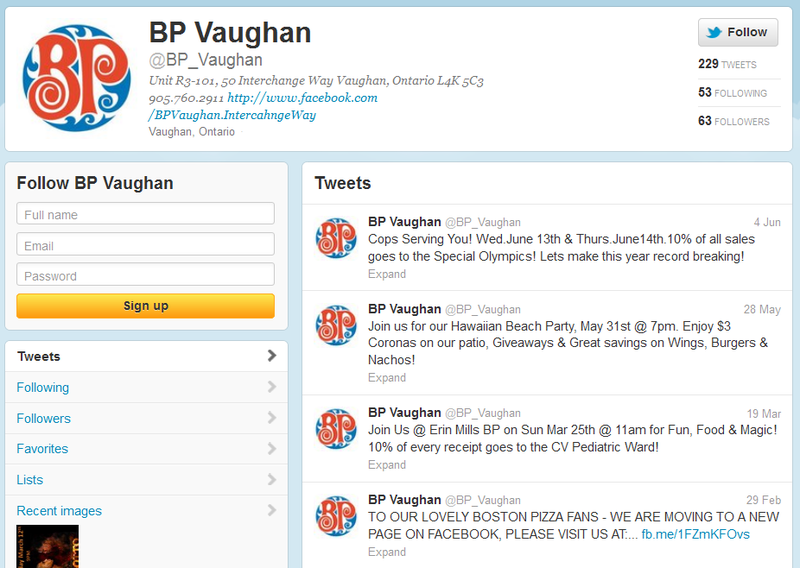 They have seven tweets that date from February to April 2011 with 11 followers and 11 accounts following them. For the record, I am not one of them. The tweets are fine in terms of content. One references Dragons’ Den, the CBC show on which Jim Treliving, co-owner and co-CEO of Boston Pizza (@JTreliving), is one of five entrepreneurial judges. Otherwise, there’s a decent mix of events and promos. But they are not using Twitter to monitor their competition. 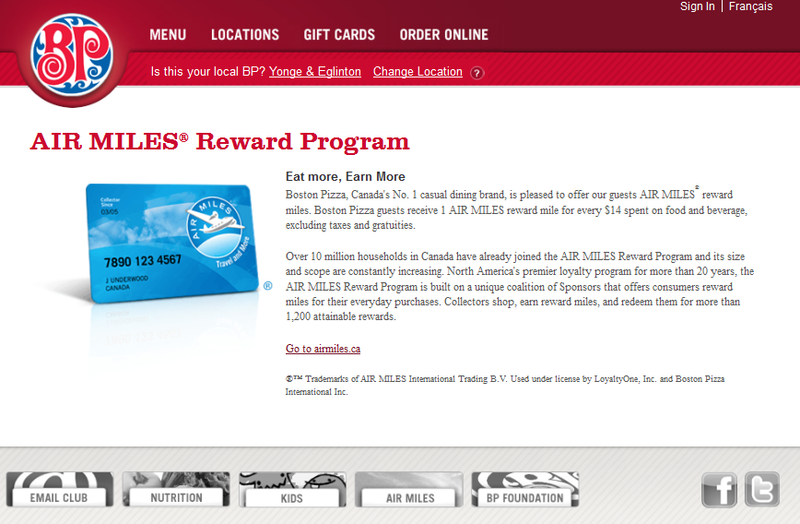 Or other Boston Pizza chains, beyond the central corporate account (which appears to be a squat and we will come back to that). From what I can tell, they do not seem to use Twitter for much of anything, beyond following a few charities and sports accounts. None of that content gets retweeted. 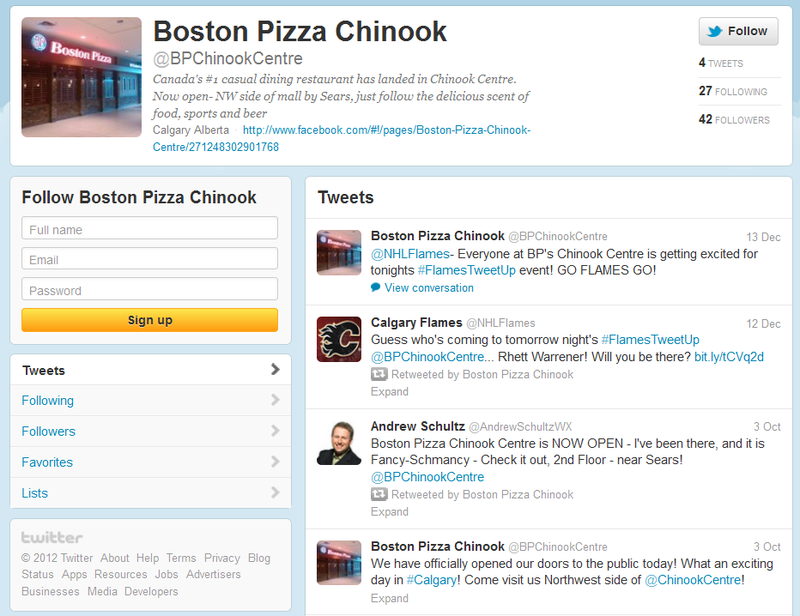 One would think sharing news about upcoming sports games if you are a sports bar would make a certain sense. The engagement is low, but then, when you only tweet seven times, you can’t expect others to engage with any great enthusiasm. I don’t know why you would keep an account you can’t be bothered to maintain. There are even services to get rid of inactive tweeters in bulk. 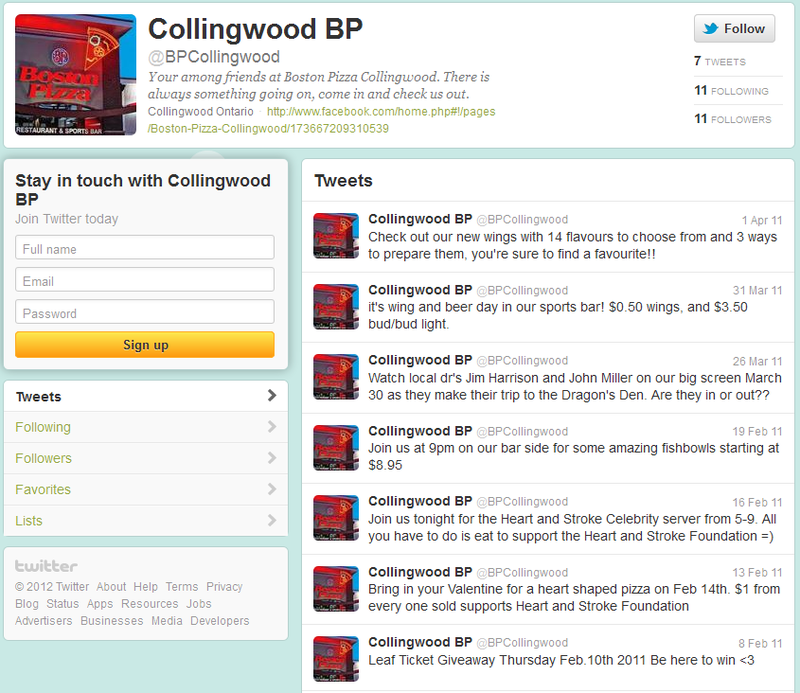 Why would you actively promote an inactive account in the restaurant? Lest you think I am unfairly picking on the Collingwood crowd, I looked at a few other franchises. Others are also having trouble with Twitter. Let’s take a look at Facebook for comparison, shall we? Getting a visit from a current world leader is exciting stuff for a restaurant. You don’t meet the Prime Minister every day and I see the merit in using something like that for promotional purposes. What I can’t figure out is why Prime Minister Harper was at this restaurant. You’d think someone would offer an explanation or a little more context. It’s curious that the people running this account followed up with the PMO to get the photo (that’s their office seal in the bottom right) but didn’t bother to moderate the comment advocating sucker-punching the Prime Minister. Don’t get me wrong — it’s not all bad. 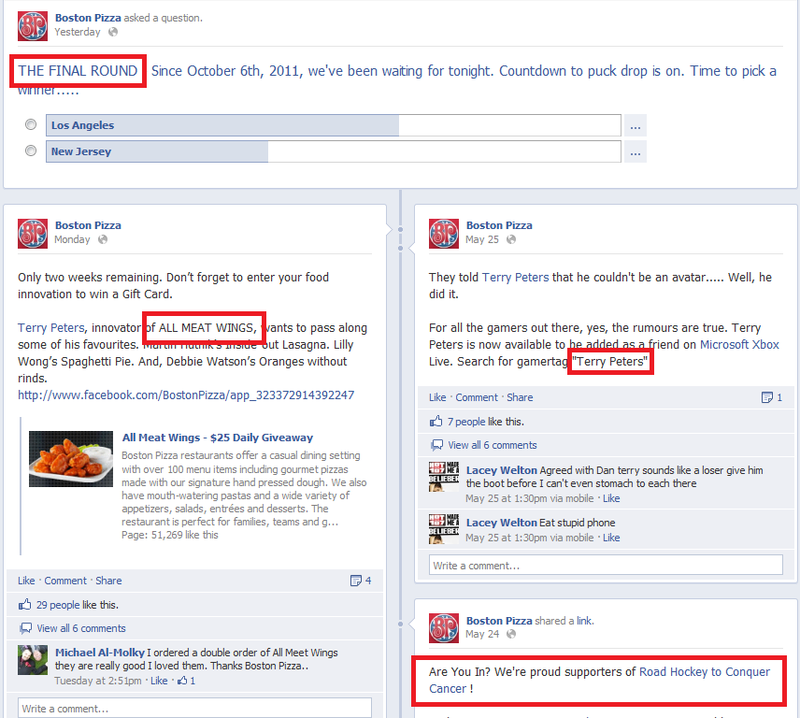 Linking to the main BP Facebook page makes sense. I like the clock feature that lets you know if they’re open or how long it will be until they do. Some of the posts show photos of food and promote deals of the week, which makes sense as an area in which to experiment. It’s fairly accepted in the age of social media that writing in all caps is equivalent to shouting at people. I automatically start to tune out when I see it. The less we say about the grammar, the better. 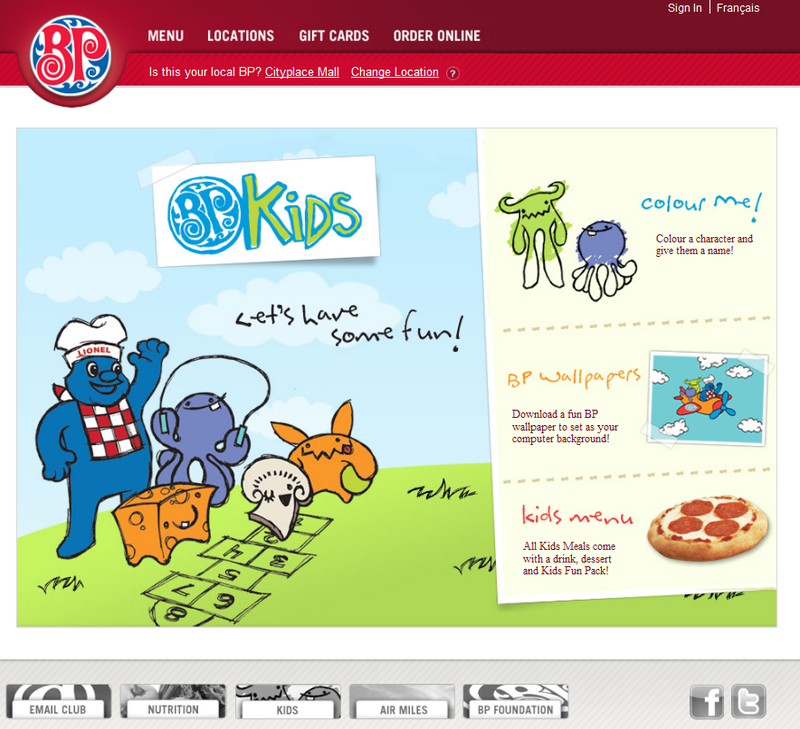 Better still, BP corporate has foregrounded social interactions on the landing page of their main website, as you may have noticed in the earlier photo. The professional content shows some creativity while staying on brand and message (wings promotion, hockey, supporting cancer charities to demonstrate corporate social responsibility, etc.). Most posts have at least 20 to 30 responses either in likes or replies. Why not take the centralized approach that works well for the web platform and apply it to your social channels? At the very least, why not shut down the poor examples? 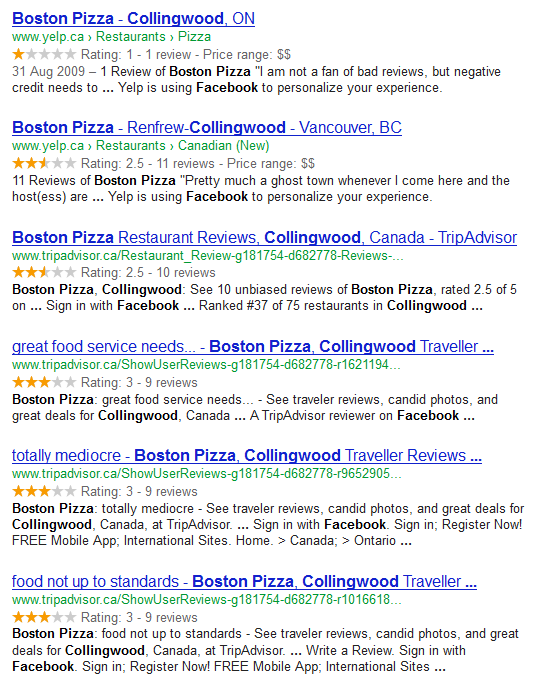 PC World has a solid article about what to do and not do about bad Yelp reviews. 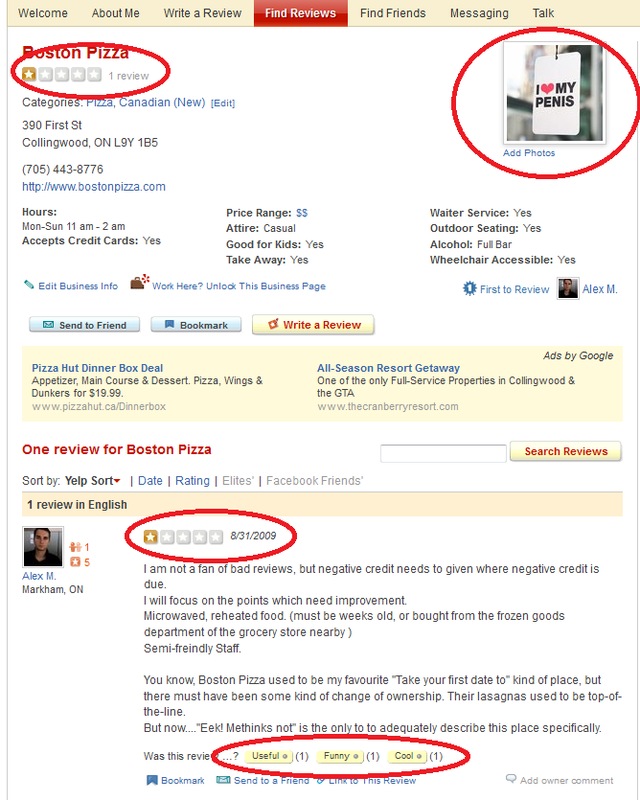 Mostly, they recommend taking ownership of your Yelp page and doing what you can to address the feedback. So if you don’t have time to tweet and Facebook is sort of meandering along, why not tackle the social platform where negative brand impressions are forming and, for heaven’s sake, devote some of your energy to turning the tide? One of the more interesting things about social media is just how slippery a slope it presents for brand management. Starting a Twitter account and tweeting once a day may not seem like much in the beginning, but you get the effort out that you put in. And no effort gets you squat. 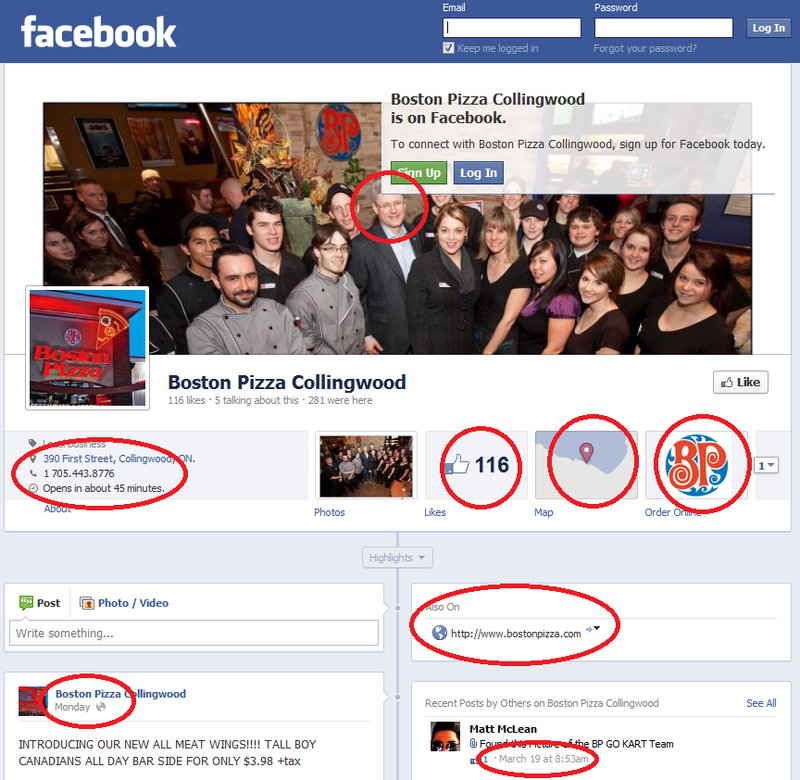 My informal survey of Boston Pizza’s central activity on Twitter and Facebook is largely positive, but by straying so far off message, the franchises are eroding some of that confidence in the brand. It does make me curious about their social media policy. Have they tried a centralized approach? Restaurants like this chain are generally full of young staff working their way through school and other opportunities. Why isn’t someone stepping up to run the local accounts and adding valuable experience to his or her resume? Is corralling all the restaurants problematic in other ways? Are the Twitter and Facebook accounts in existence because the central office mandated them? 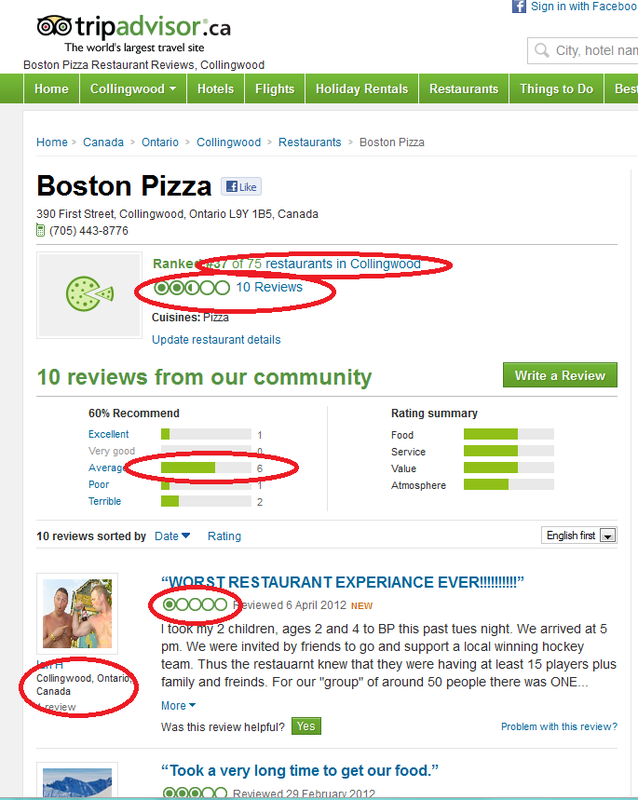 Is it feasible to have local restaurants feed traffic to the centralized social media feeds and take the burden of maintenance, and the risks that come with that task, out of the hands of individual franchises? Internet: Are you finished? I want to talk some more about Pinterest.